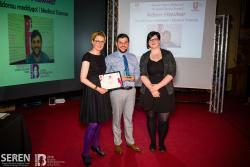 At this year`s Student-led Teaching Awards, Adam Hawker, the Medical Sciences Senior Course Representative won the Student Choice Course Rep Award. The School of Medical Sciences gives all students ownership of their degree programs and enables them to perform at their highest level. The School offers also a Professional Experience Program PEP, jointly with the Bangor Employability Award and Santander, to allow all students to develop employability skills while they are here at Bangor University.